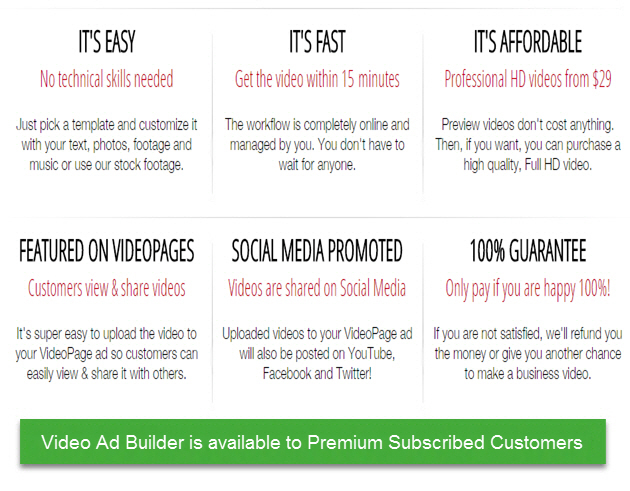 VideoPages® Video Ad Builder | Make Amazing Videos | No Experience Needed! Make Videos in Minutes with VideoPages Video Ad Builder! All Premium customers can enjoy using our easy-to-use online video ad builder to make great looking videos, fast and FREE! You only pay for the video once you love what you see! Videos are priced between $29 and $79 on average! If you can use a mouse and keyboard, you're in business! Choose a video template, provide your own photos/videos or use our royalty free music and stock footage! Click the tabs above the video to view some sample video templates! It's simply fun to use!